Our Santa Barbara property is situated in a quaint residential area and conveniently near all the area's popular attractions including miles of amazing coastline as well as the exciting downtown area where our guests will experience unique shopping, dining, art and culture. Fiesta, Summer Solstice, and a variety of additional summer festivals offer traveling families a taste of local Santa Barbara flare. At the Best Western Plus Encina Inn & Suites, guests can enjoy a great value within minutes of all the excitement of Santa Barbara. One and two bedroom suites, along with townhouses feature full kitchens. This makes them perfect for groups or longer stays. On-site dining, outdoor pool, spa and exercise facilities all contribute to making you feel pampered while on vacation. 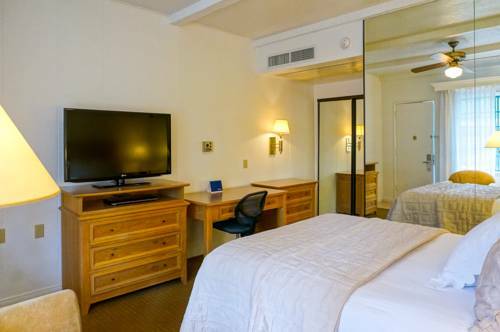 This Santa Barbara Best Western is a prime choice for business travelers in town for work with Cottage Hospital, Sansum Clinic, or the Arlington, Granada and Lobero theaters. Many of our guests are here for medical procedures and require long-term stays. When you're recovering, it's important to feel comfortable and relaxed. You'll feel right at home at our Santa Barbara hotel. Family and friends visiting patients in the hospital, as well as visiting nurses and doctors choose to stay at our spacious Santa Barbara hotel. We offer great value in the heart of Santa Barbara. You can expect spacious accommodations, luxurious bedding and friendly service. Our Santa Barbara hotel is unique because it's designed for long-term stays and overnight guests alike. You can also stock up and enjoy the convenience of a full kitchen while on vacation. Whether you're here for an extended stay or just the weekend, we'll provide everything you need for a relaxing getaway. From: North or South. Take Highway 101 to the Mission Street Exit. Turn east toward the mountains, and drive two blocks to Bath Street, then make a left turn onto Bath Street. The Best Western Plus Encina Inn & Suites is two blocks beyond on the right side. Paseo Nuevo,3.00 mile(s) from Paseo Nuevo, outdoor shopping plaza located on State Street, downtown. La Cumbre Shopping Plaza,3.00 mile(s) from La Cumbre Shopping Plaza, open air shopping plaza featuring high-end retailers and restaurants. Solvang,30.00 mile(s) from Solvang, enchanting Danish village. Montecito,7.00 mile(s) from Montecito, famous for its elegant estates and celebrity residents.